TOKAJI.com .::. 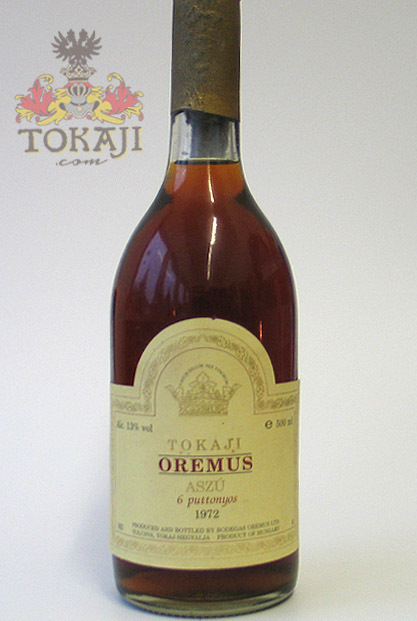 Buy Historic Tokaji : 1972 Oremus Tokaji Aszú 6 put. You are here: Home BUY TOKAJI Buy Historic Tokaji 1972 Oremus Tokaji Aszú 6 put. 1972 Oremus Tokaji Aszú 6 put. 1972 was the best vintage of the last century in Tokaj. This wine was still in casks, when Oremus bought the Tolcsva estate and its cellars, and then bottled by the new winery in 1994. "Palate: Dense, bold, full-bodied, perfect acidity. After 60 minutes in the glass it became better and better." "Complex, layered with dried mango and sweet floral notes. Elegant and beautiful to enjoy now." "This bottle was everything one should look for in a mature Tokay. Extremely concentrated, deep and rich, sweet yet with enough (citric) acidity to make it feel fresh. Superb!!! Buy more? Yes." "An old-style Aszú, but delicious and creamy. Dark amber color and mature character. Attractively ripe and rich with very sweet raisin and dried apricot flavors and a velvety finish." "Aromas of caramel, old Calvados and furniture polish. Very creamy in the mouth, with flavours of caramelised apple and baked apricot. As with the 81, this finishes with surprising freshness and cut. Fresh citrus and caramelised pitted fruits in the finish."